An atrial septal defect (ASD) is an opening in the atrial septum, or dividing wall between the two upper chambers of the heart, known as the right and left atria. 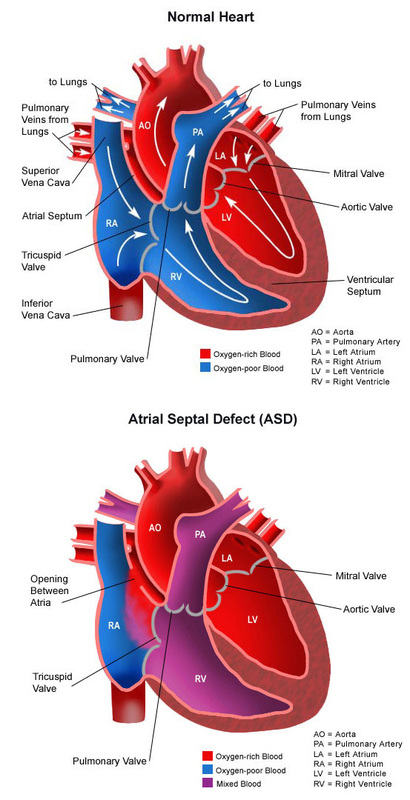 ASD can be a congenital (present at birth) heart defect, or it can result from the failure of normal postnatal closure of a hole that is present in the heart of every fetus. Normally, oxygen-poor (blue) blood returns to the right atrium from the body, travels to the right ventricle, then is pumped into the lungs where it receives oxygen. Oxygen-rich (red) blood returns to the left atrium from the lungs, passes into the left ventricle, and then is pumped out to the body through the aorta. An atrial septal defect allows oxygen-rich (red) blood to pass from the left atrium, through the opening in the septum, and then mix with oxygen-poor (blue) blood in the right atrium. Atrial septal defects occur in a small percentage of children born with congenital heart disease. For unknown reasons, girls have atrial septal defects twice as often as boys. The heart is forming during the first eight weeks of fetal development. It begins as a hollow tube, then partitions within the tube develop that eventually become the septa (or walls) dividing the right side of the heart from the left. Atrial septal defects usually occur when the partitioning process does not occur completely, leaving an opening in the atrial septum. Some congenital heart defects may have a genetic link, either occurring due to a defect in a gene, a chromosome abnormality or environmental exposure, causing heart problems to occur more often in certain families. Most atrial septal defects occur sporadically (by chance), with no clear reason for their development. What are the types of atrial septal defects? Ostium secundum atrial septal defect. This is the most common atrial septal defect, affecting over two-thirds of people with atrial septal defects. It is caused when a part of the atrial septum fails to close completely while the heart is developing. This causes an opening to develop in the center of the wall separating the two atria. Ostium primum atrial septal defect. This defect is part of atrioventricular canal defects, and is associated with a split (cleft) in one of the leaflets of the mitral valve. Sinus venosus atrial septal defect. This defect occurs at the superior vena cava and right atrium junction, in the area where the right pulmonary veins enter the heart. As a result, the drainage of one or more of the pulmonary veins may be abnormal in that the pulmonary veins drain to the right atrium, rather than the left atrium. Coronary sinus atrial septal defect. This defect is located within the wall of the coronary sinus, where it passes behind the left atrium. The coronary sinus carries the blood flow from the heart’s own vein, into the right atrium. It is the rarest of all atrial septal defects. Why is an atrial septal defect a concern? Over time, this heart defect can cause lung problems if not repaired. When blood passes through the ASD from the left atrium to the right atrium, a larger volume of blood than normal must be handled by the right side of the heart. This extra blood passes through the pulmonary artery into the lungs, causing higher amounts of blood flow than normal in the vessels in the lungs. A small opening in the atrial septum allows a small amount of blood to pass through from the left atrium to the right atrium. A large opening allows more blood to pass through and mix with the normal blood flow in the right heart. The lungs are able to cope with this extra blood flow for a long period of time. In some patients, the extra blood flow eventually raises the blood pressure in the lungs, usually after several decades. This then hardens the blood vessels in the lungs, causing them to be diseased, resulting in permanent changes in the lungs. The symptoms of an atrial septal defect may resemble other medical conditions or heart problems. Always consult your child’s physician for a diagnosis. Your child’s physician may have heard a heart murmur during a physical examination, and referred your child to a pediatric cardiologist for a diagnosis. In this case, the heart murmur is caused by the extra blood from the ASD flowing through the pulmonary valve. Chest X-ray. A diagnostic test which uses invisible X-ray beams to produce images of internal tissues, bones and organs onto film. With an ASD, the heart may be enlarged because the right atrium and ventricle have to handle larger amounts of blood flow than normal. Also, there may be changes that take place in the lungs due to extra blood flow that can be seen on an X-ray. Learn more about X-ray. Electrocardiogram (ECG or EKG). A test that records the electrical activity of the heart, shows abnormal rhythms (arrhythmias or dysrhythmias), and detects heart muscle stress. Learn more about electrocardiogram. Echocardiogram (echo). A procedure that evaluates the structure and function of the heart by using sound waves recorded on an electronic sensor that produce a moving picture of the heart and heart valves. An echo can show the pattern of blood flow through the atrial septal opening, and determine how large the opening is, as well as how much blood is passing through it. Learn more about echocardiogram. The family’s opinion or preference. Secundum atrial septal defects may close spontaneously as a child grows. Once an atrial septal defect is diagnosed, your child’s cardiologist will evaluate your child periodically to see whether it is closing on its own. Usually, an ASD will be repaired if it has not closed on its own by the time your child starts school—to prevent lung problems that will develop from long-time exposure to extra blood flow. The decision to close the ASD may also depend on the size of the defect. Individuals who have their atrial septal defects repaired in childhood can prevent problems later in life. Medical management. Many children have no symptoms, and require no medications. However, in rare circumstances, children may need to take medications to help their heart work better, since the right side is under strain from the extra blood passing through the ASD. Medications may be prescribed, such as diuretics. Diuretics help the kidneys remove excess fluid from the body. This may be necessary because the body’s water balance can be affected when the heart is not working as well as it could. Surgical repair. Some children may need their ASD repaired surgically at the Tidwell Procedure Center at CHOC Children’s. The repair is performed under general anesthesia and the defect may be closed with stitches or a special patch. Learn more about heart surgery. Device closure. Device closure is frequently performed for secundum ASD, depending on the size of the defect and the weight of the child and is performed in CHOC’s state-of-the-art catheterization lab. During this cardiac catheterization procedure, the child is sedated and a small, thin, flexible tube (catheter) is inserted into a blood vessel in the groin and guided to the inside of the heart. Once the catheter is in the heart, the cardiologist will pass a special device, called a septal occluder, into the open ASD, preventing blood from flowing through it. Learn more about cardiac catheterization. What is the long-term outlook after ASD repair? The majority of children who have had an atrial septal defect repair can live healthy lives. Your child’s cardiologist may recommend that your child take antibiotics to prevent bacterial endocarditis for a specific time period after discharge from the hospital. Outcomes also depend on the type of ASD, as well as how early in life the ASD was diagnosed and whether or not it was repaired. With early diagnosis and repair of an ASD, the outcome is generally excellent, and minimal follow-up is necessary. When an ASD is diagnosed later in life, if complications occur after surgical closure, or the ASD is never repaired, the outlook may be worse than normal. There is a risk of developing pulmonary hypertension (high blood pressure in the blood vessels of the lungs). These individuals should receive follow-up care at a center that specializes in congenital heart disease. Consult your child’s physician regarding the specific outlook for your child. When the procedure is complete, the catheter(s) will be withdrawn, and a small bandage is applied. If blood vessels in the leg were used, your child will be told to keep the leg straight for a few hours after the procedure to minimize the chance of bleeding at the catheterization site. Your child will be taken to a unit in the hospital where he or she will be monitored by nursing staff for several hours after the test. The length of time it takes for your child to wake up after the procedure will depend on the type of medicine given to your child for relaxation prior to the test, and also on your child’s reaction to the medication. After the procedure, your child’s nurse will monitor the pulses and skin temperature in the leg or arm that was used for the procedure. Your child may be able to go home after a specified period of time, providing he or she does not need further treatment or monitoring. You will receive written instructions regarding care of the catheterization site, bathing, activity restrictions and any new medications your child may need to take at home. Ventilator. A machine that helps your child breathe while he or she is under anesthesia during the operation. A small, plastic tube is guided into the windpipe and attached to the ventilator, which breathes for your child while he or she is too sleepy to breathe effectively on his or her own. Many children have the ventilator tube removed right after surgery, but some other children will benefit from remaining on the ventilator for a few hours afterwards, or overnight, so they can rest. Intravenous (IV) catheters. Small, plastic tubes inserted through the skin into blood vessels to provide IV fluids and important medications that help your child recover from the operation. Arterial line. A specialized IV placed in the wrist, or other area of the body where a pulse can be felt, that measures blood pressure continuously during surgery and while your child is in the CVICU. Urinary catheter. A small, flexible tube that allows urine to drain out of the bladder and accurately measures how much urine the body makes, which helps determine how well the heart is functioning. After surgery, the heart will be a little weaker than it was before; the body may start to hold onto fluid, causing swelling and puffiness. Diuretics may be given to help the kidneys remove excess fluids from the body. Heart monitor. A machine that constantly displays a picture of your child’s heart rhythm, and monitors heart rate, arterial blood pressure, and other values. Your child may need other equipment, not mentioned here, to provide support while in the CVICU, or afterwards. The hospital staff will explain all of the necessary equipment to you. Your child will be kept as comfortable as possible with several different medications; some of which relieve pain and some of which relieve anxiety. The staff may also ask for your input as to how best to soothe and comfort your child. You will learn how to care for your child at home before your child is discharged. Your child may need to take medications for a while and these will be explained to you. The staff will provide instructions regarding medications, activity limitations and follow-up appointments before your child is discharged. Most children feel comfortable when they go home, and have a fair tolerance for activity. Your child may become tired quicker than before the repair, but usually will be allowed to play with supervision, while avoiding blows to the chest that might cause injury to the incision or breastbone. Within a few weeks, your child should be fully recovered and able to participate in normal activity. Pain medications, such as acetaminophen, may be recommended to keep your child comfortable at home. Your child’s physician will discuss pain control before your child is discharged from the hospital. If you are pregnant and would like a prenatal consultation, our team of fetal cardiologists are available for families and referring physicians to provide immediate consultations, second opinions and fetal echocardiograms for pregnant women. Our office is open 8 a.m. – 5 p.m. We schedule appointments within 48 hours, and offer same day appointments for urgent cases.